Grinding wheels and unprotected eyes do not go well together. It all started on a Friday afternoon, after a long week at work and a desperate attempt to get stuff done before Bendigo Swap Meet. For thirty years we have been making the pilgrimage, and full of pregnant expectation I tried to clear the decks by doing late on Friday the tasks that otherwise demanded to be done on Saturday. So there I was, in a hurry, tired and irritated, wielding a grinder and cutting corrugated iron roofing sheet late on Friday afternoon. Some sweaty grit accumulated on my brow, I wiped my forehead and rubbed the sweat from my eyes and that was where things went wrong. I felt a gritty scratching in my right eye, ignored it and finished the job, rubbing my itchy eye a dozen more times. Packing away the tools and cleaning up it became obvious my eye was not clearing up on its own. I tried washing it out, flushing with water but it just got worse. Consulting my beloved she took one look at me, grimaced at the bloodshot mess and demanded an expert appraisal. It was by then precisely one minute past the exact moment when the local doctor surgery closes. So who knew the Eye and Ear Hospital was so busy on Friday evenings? We rock up and join the queue for triage. The ever helpful nurse shines a torch into my now red and weeping eye and cheerfully says, "Yep, there is something there… You will need to see the doctor. And it is a three to four-hour wait." We consider the alternatives. My biggest worry is of course not about the prospect of losing sight in one eye but the slight chance that the procedure might interfere with the next day’s annual pilgrimage to Bendigo. Get your priorities right, son. After moments of deliberation, around 8.00pm by now, we leave the thirty or so people slumped in the chairs in Casualty and go home. I sleep – fitfully – until four in the morning and get up and return to Casualty. It is totally empty and I am ushered in to see a nurse and doctor immediately. The first doctor – a trainee – says he cannot see any foreign object and makes me think I am a hypochondriac. The boss comes in, instantly finds the small metal splinter, spooks me with stories of people getting rust infections in their eyeballs and flicks it out with the tip of a needle in less time than it takes to read this sentence. Instant relief. The lecture about eye safety that follows takes longer though, and probably hurt my dignity more than the splinter hurt my eye. How stupid are we to work unsafely and risk our sight every time we are cutting, grinding, linishing… The list goes on. I always ignorantly assumed my prescription spectacles were enough protection but now I know better. They offer no side protection at all, and with a moment’s reflection it is self-evident that they are inadequate. As the good eye-doctor said: "You only have two of them… They are worth looking after." So next trip to the tool shop saw a tiny investment in not just one, but two pairs of safety overglasses. One set is installed at the bench grinder, the other living within reach of the workbench and to be used whenever needed. And how was the swap meet I hear you ask? We wandered around confused as always, me putting drops in my eyes every two hours and floating around in a sleep deprived fog. 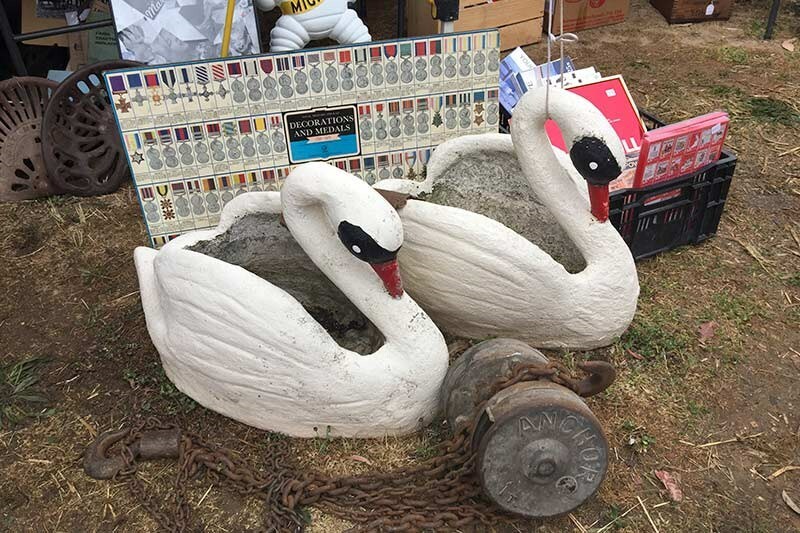 I did not buy the concrete garden swans for $100 each… But a week later they were in a local antique store for $1200 the pair. 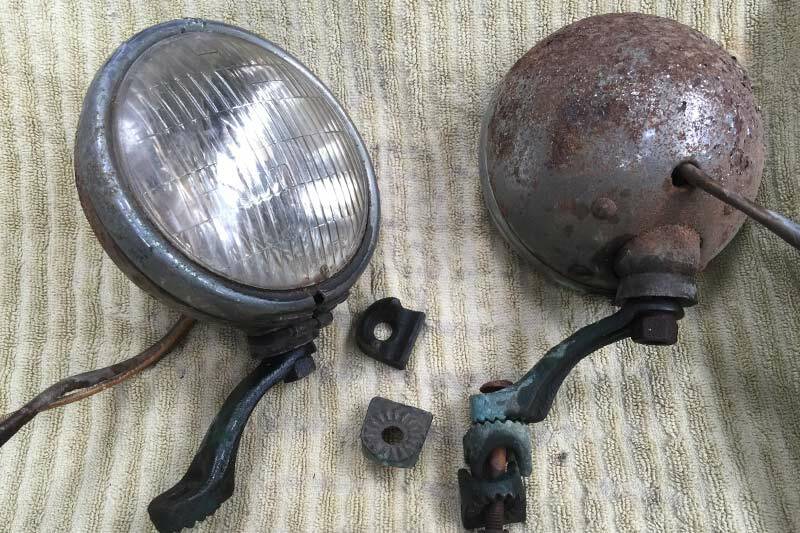 I managed to score some 1950s brackets for the blue spot 1950s driving lights I bought last year. 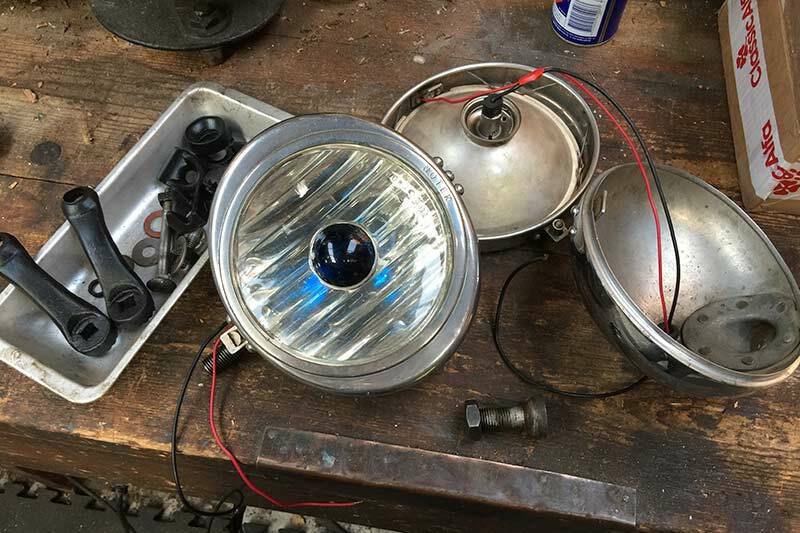 They have scrubbed up nicely on the wire wheel – safety glasses in action – and the home-made spray booth again came into good use to give them a matt black finish. 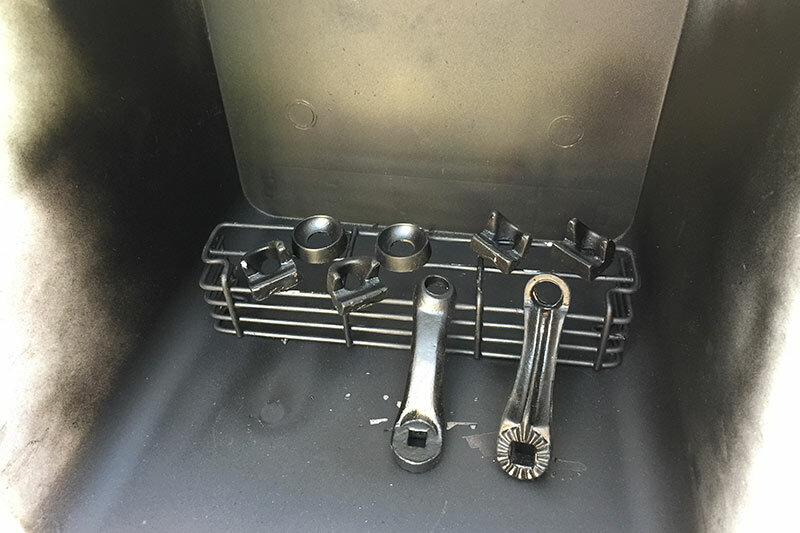 Much nicer than the flat steel brackets I otherwise was planning to use. And they will adorn the Light 15 Citroen sometime soon. A small hidden toggle switch to go under the dash, a relay and some wiring and Betty is your aunty. A parcel of supplies for the Alfa Spider has arrived so that needs attending to next. I missed my slot with the panel beater before Christmas meaning any ideas of using it as Santa’s sleigh have been shelved for twelve months. But it is red, so not such a stretch of the imagination. After all that work, it seems a shame to sell it!